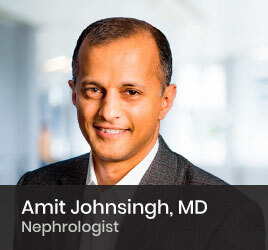 Dr. Johnsingh is the current Executive Vice President of Florida Kidney Physicians. He is a distinguished member of the Alpha Omega Alpha Medical Honors Society. He is a former Chief-of-Staff at South Florida Baptist Hospital in Plant City, Florida and was also elected to the Board of Directors of Baycare Health Systems. Additionally, he is the Chief Medical Officer of Healthmap Solutions, a company that aims to help organizations eliminate waste existing in healthcare delivery systems. He is currently an attending teacher in the Internal Medicine Residency Program at Brandon Regional Hospital. He serves as Medical Director of DaVita Sun City Dialysis Unit in Sun City Center, where he oversees in-center hemodialysis and peritoneal dialysis, as well as home hemodialysis.